This is an easy chili recipe that you can throw in the slow cooker and forget about till it's done. I made this for my family when they were out skiing, and they all raved about how good the warm chili tasted when they got back from the slopes. Easy and a real winner! Heat the oil in a skillet over medium heat. Place turkey in the skillet, and cook until evenly brown. Add chopped onion and saute until translucent, about 5 minutes. 2. 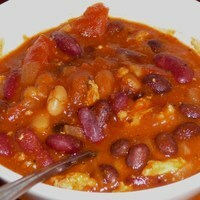 Add the turkey, tomato soup, diced tomatoes, kidney beans, black beans and onion to the slow cooker. Season with garlic powder, cumin, black pepper, and salt. This was a truly delicious chili that Nancy made while we were skiing. It's not too spicy, but has a lot of wonderful flavor and a little kick. if you don't have kids, you could try adding some of the red pepper flakes or chili powder. Still, I love spicy food and still thought it tasted great without either. Either way, you won't be disappointed!